The 29 rooms and suites at Batty Langley's are ridiculously grown up and lavish with a touch of humour. The antiques, four-poster beds and fine art are complemented by extraordinary bathrooms with vintage fixtures and fittings. Apple TV, Ren products and complimentary WiFi are standard features in all of the rooms. There's one Double Room on the fourth-floor which is suitable for wheelchair users and accessible by lift. Cots are free and can be added to all of the rooms. 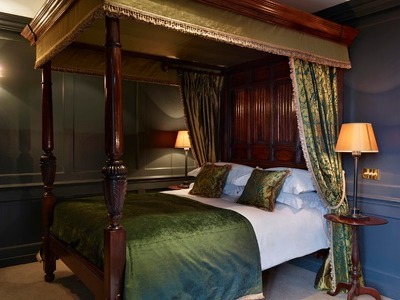 Club Double rooms have a 17th-century carved oak bed. Windows are hung with heavy silk curtains or wooden shutters. The en-suite bathroom has restored vintage fixtures and fittings, with either a cast iron bath or a period style shower. 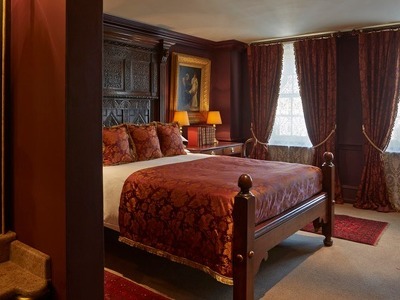 Superior Double rooms have a 17th-century carved oak bed. Windows are hung with heavy silk curtains or wooden shutters. The en-suite bathroom has restored vintage fixtures and fittings, with either a cast iron roll-top bath or a period style shower. 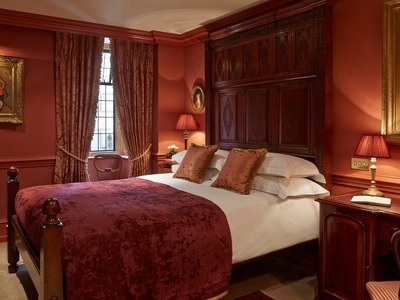 The spacious Deluxe Double Rooms feature a carved wooden bed or a four-poster bed, a free-standing roll-top bath and a spacious shower. An Apple TV with a media hub is also included. Complete with a tempting four-poster bed, walk-in shower, roll-top bath and a stylish furnished terrace this room has lots of additional room to entertain. The hidden flat screen TV has Apple TV and media hub technology. More Senior than Junior these suites are filled with antique furniture and oil painting. 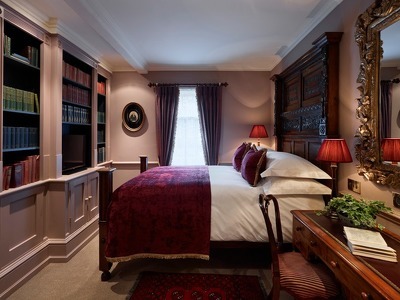 The beds are ultra-comfortable beds and the en-suite bathrooms truly extraordinary with vintage roll-top baths, walk-in showers and throne loos. 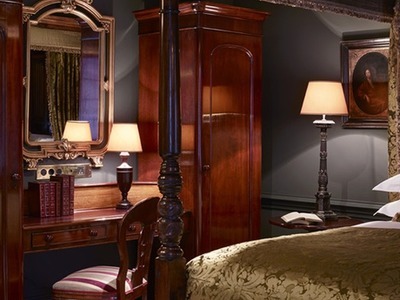 Peter Merzean’s room boasts an enormous antique ceramic bath with Carrara marble casing. Best remembered as the subject of a nursery rhyme, Kitty was a well known 18th-century London courtesan who started as a humble milliner. Kitty’s boudoir has a lavish four-poster and, in the en-suite bathroom, a genuine Victorian bathing machine. There’s a balcony and a separate living room with sofa bed. The flat screen TV with Apple and media hub technology is discreet. 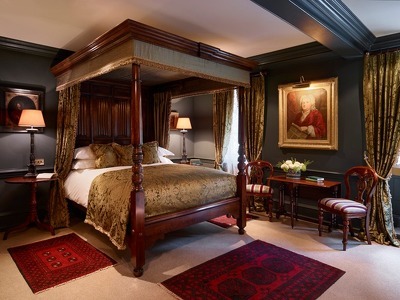 The Earl of Bolingbroke suite is spread across two levels, with a luggage lift direct to your door. There’s a large, sunny terrace with views to the Olympic Park. The en-suite marble bath is a genuine antique from Tuscany and the enormous canopy bed was built for a rather naughty bishop. Play hide and seek to find the discreet flat screen TV with Apple and media hub technology. 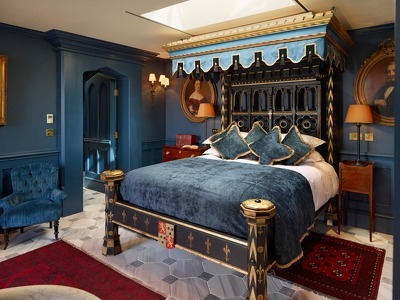 Voted one of the 'world's 50 best new hotels' by Travel & Leisure magazine and listed as 'one of London's six best hotels' by Conde Nast Traveller, you can't go wrong with east London's luxury hotel Batty Langley's. Expect old-fashioned hospitality with luxurious and traditional interiors in a rather grand Georgian townhouse. This unapologetically eccentric hotel in Spitalfieldslds is a unique experience in the corner of old London where you'll feel at home and be looked after and welcomed like one of the family. Speaking of family, children are welcome and all baby kit is available, all you need to do is ask. Oh, and cots are free and can be added to all of the rooms. Sister hotels The Rookery in Clerkenwell and Hazlitt's in Soho have a loyal client base and Batty Langley's is following in their footsteps. Batty Langley's feels like a grand townhouse and has its own richly furnished drawing room, library and parlour. Help yourself to a drink from the honesty bar and if it's a mild evening take it out into the courtyard garden. Lavish private rooms are perfect for small gatherings, photo shoots and celebrations. Days here begin with bacon-stuffed sandwiches or smoked-salmon bagels – best enjoyed in bed – and end with a civilised tipple or two in one of the lounges. Rates usually exclude Continental breakfast (£12 for adults; £5 for mini Battys). You’ll get a baker’s basket filled with just-baked croissants, warm breads and pastries, plus preserves and yoghurt, and can add granola, a bacon sandwich or salmon bagel. Cancellation is permitted free of charge up until noon two days prior to arrival after which full payment is due. The 29 rooms and suites at Batty Langley's are ridiculously grown up and lavish with a touch of humour. The antiques, four-poster beds and fine art are complemented by extraordinary bathrooms with vintage fixtures and fittings. Apple TV, Ren products and complimentary WiFi are standard features in all of the rooms. There's one Double Room on the fourth-floor which is suitable for wheelchair users and accessible by lift. Cots are free and can be added to all of the rooms. Very nice hotel that is a little quirky! Staff were great and very friendly and helpful. There is no restaurant and room service is a little limited but there are plenty of places in the area to eat. What a great hotel. My absolute favourite and a hidden gem. For anyone who is tired of big and impersonal hotel chains, this is the best remedy. Almost hidden behind Liverpool Street, its a small and very special place. Great location to walk into Shoreditch and explore the city but also very well connected to any other part in London. The staff is great and I love the fact you get these old school heavy door keys that you can then leave with reception when you go. The rooms and the whole hotel are so special, you feel catapulted into a different Georgian time. The beds are amazingly comfy and the bathrooms perfect. I just love it here and can't wait to go back! An amazing hotel steeped in history.it resides in the 1724 Langley household which sits atop the old St Mary medieval hospital. The staff are friendly, the rooms are superb and the facilities are plenty. Fantastic stay,would love to return again. Absolutely love this hotel. We stayed one night for our 5 year anniversary and the atmosphere is just fab, you feel like you are in another era but with all the mod cons. We were upgraded to the Batty Langley room which has a 4-poster bed and an amazing terrace. Very surprised by how big the room was by London’s standards and especially given the great location. So much attention to detail, some great common spaces and an honesty bar to boot. Stay here, you will not regret it! Sensationally comfortable bed. The hotel is wonderful. Right around the corner from Spitalfields market and Liverpool Street Station the location is great for exploring all of London, all that without being noisy. Staff was wonderful, very attentive without being too keen. The room felt like something from another era with easily the most comfortable bed (and stunning linen) in London we’ve ever slept in. We will definitely stay there again. Thanks!! !